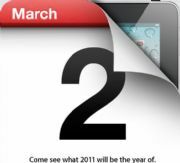 March 2nd is an iPad Apple event. BGR has a supposedly exclusive pic that it now admits may be a render, but its pretty clear from the invite that new iPads are coming soon. Yes! At first I didn't really care much for cameras on an iPad, but after using Facetime a few times I can see the utlity. It's pretty cool to show someone what you're doing while on the phone, as long as you are using a headset. The last time I did this I showed my hungry friend some chicken I was cooking (i.e. making sure the chicken my wife prepared doesn't burn). I hope Apple hasn't wasted time and resources on a Retina display. It was a significant expense for the iPhone 4, but the iPad's screen is already beautiful. I'd rather see a screen that stands up better to sunlight, because the iPad is a pain to use outside. I'd also rather see a thinner and lighter iPad, which should be expected since Apple always slices off some fat with each revision. The new iPad definitely needs a faster processor, because multitasking is noticeably slower than on my iPhone 4, which has double the RAM. As applications get more complex, swithcing between them requires more juice. Finally, an SD or USB port would be nice, but not necessary. DropBox and Goodreader have pretty much solved any file transfer issues for me. I agree that a native Apple solution would be superior, but I'd prefer the iPad to be left without a file system. The simpler, the better. My next post will have some rants about some of my favorite and least favorite apps. The Daily, I'm looking at you - shape up or ship out if you want my subscription!